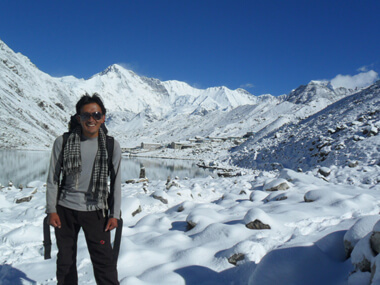 Gokyo and kalapatthar trek is one of the most famous trekking in Nepal. First, we take splendid mountain flight to Lukla and then go to Namche Bazzar through Dudhkoshi River. The trail to Gokyo is exciting enough trek. We gradually walk up the valley and go through the forest. You will see different species of flora and fauna through out the forest such as deer and rhododendron. 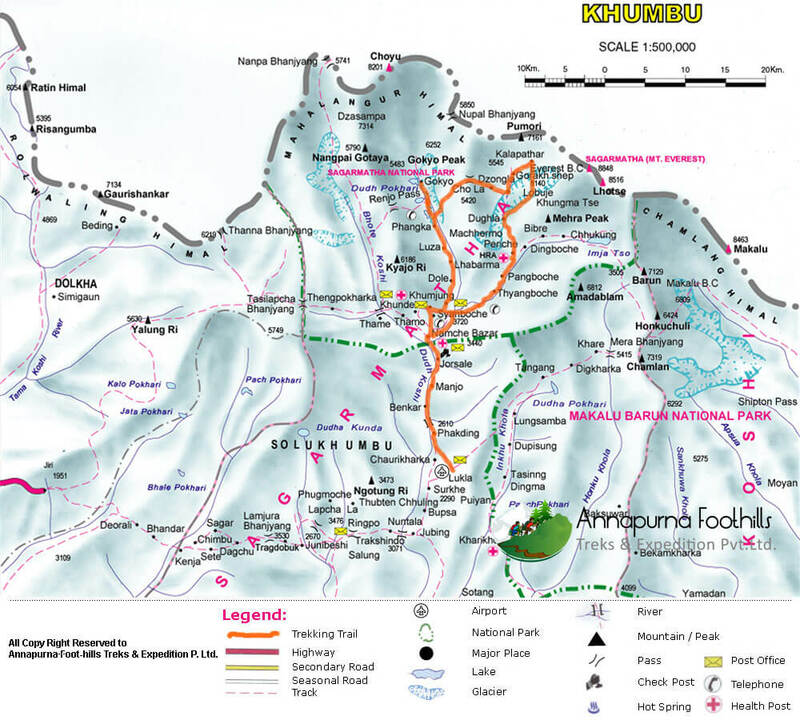 We pass through other villages like Khumbu, Khunde and Khumjung. After reaching Khumjung valley, we split from the main busy trail towards the quiet village of Phortse Tenga and finally you will find yourself at our destination Gokyo chola pass Everest base camp Trek. There are two beautiful lakes at Gokyo and it was once more popular as a Yak pasture. After passing grazing settlement of Yak, we reach the Gokyo lakes and we climb the Gokyo peak there. You can also get an opportunity observe the stunning scenery of Mt. Everest, Makalu, Cho Oyo and Gyanchujgang is remarkable sight in the Khumbu region. We reach at Dzongla after crossing the Cho La pass. You will come to notice the spectacular view of Amadablam and Taweche. After reaching Zhongla ascent, we continue trekking towards Gorak Shep and climb Kalapatthar. The impressive up close view of Mt. Everest can be seen from there. We pass through Tengboche while returning and we take rest there for a while. We will be enjoying the incredible views of fascinating mountains from there. Everest 8848m., Lhotse 8516m., Nuptse 7896m, Pumori 7145m., Amadablam 6812m. Thamserku 6800m, Khumbila 5751m, Kwangde Ri 6187m,, Kangtenga 6645m, Kusum Kangru 6369, Makalu 8463m, Island Peak 6189m, Chhukungri 5845m, Lobuche East 6119m, Lobuche West 6145m, khumbuste 6640m, Cholatse 6640m, Cha Kung 7020m, & More attractive snowcapped peaks. The Managing Director or The Manager of company will meet you in hotel and will brief about the trip. You should clear your dues before we proceed for the trip. You are free to relax or explore around the city in the very first day. Overnight stay at Hotel. Boudhanath is a huge Buddhist stupa located about 7 km east of Thamel. It stands on a massive mandala style platform and has features similar to the Swayambhunath, though it is bigger than Swayambhunath in size. It is said that this stupa was built during the 5th Century. Every year, Thousands of pilgrims from Nepal and neighboring countries visit Boudhanath, particularly in winter and Pashupatinath temple. Pashupatinath temple is one of the biggest Hindu temple. Overnight stay at Hotel. Fly from Kathmandu to Lukla where the trek starts. Initially the trail descends steadily along the banks of the Dudh Koshi River , passing Sherpa villages and Mani stones before reaching Phakding.we stay overnight stay at guesthouse. The trail ascends gradually towards Jorsalle, crossing suspension bridges over the Dudhkoshi River before arriving at the entrance gate of the national park. After crossing three more bridges, the trail ascends through the alpine and rhododendron forest. Here it is possible to see deer and wild birds on the way before the trail ends at Namche Bazaar. Overnight stay at guesthouse with breakfast, lunch and dinner included with Tea and Coffee. Namche is tucked away between two ridges amidst the giant peaks of the Khumbu and has an abundance of lodges, tea shops and souvenir shops. It is an ideal place to spend a day, acclimatizing to the new altitude before heading off towards Tengboche. To acclimatize, you visit Khunde Hospital set-up by Sir Edmund Hillary, or take a one hour walk up to the Everest View Hotel above Namche for the sunset view of Ama Dablam, Nuptse, Lhotse and Everest. There are also good views from the National Park Centre and Museum just above the town. Overnight stay at guesthouse with breakfast, lunch and dinner included with Tea and Coffee. To acclimatize smoothly, we just make a two hours walk to Khumjung, after a visit to the Sherpa culture + Everest conquest museum of Namche Bazaar . Khumjung is a very old Sherpa village, with two monasteries, where Sir Edmund Hillary, first climber of Mount Everest in 1953 with Tenzing Norgay Sherpa, created a school and a hospital (Kunde). Afternoon is the time for rest at camp or lodge . Overnight stay at guesthouse with breakfast, lunch and dinner included with Tea and Coffee. Facing us, Ama Dablam, 22,499 feet, one of the most beautiful peaks of the world, with Matter horn and Alpamayo (South America). Our footpath goes through the slopes climbing to Khumbila, and reaches our first pass, Mon La, 13,035 feet. Steep descends to Phortse Drangka. We leave the valley going to Everest trail; we are now in Gokyo valley. Just at the limit of the tree-line, we reach the mountain pasture of Dole, Overnight stay at guesthouse with breakfast, lunch and dinner included with Tea and Coffee. 08 Trek to Machermo, (4470 meters). The footpath goes through small yak mountain pastures: Khele, Lhabarma, Luza. View on many small waterfalls. We take rest in the Camp at Machermo, facing Kyajo glacier. Overnight stay at guesthouse with breakfast, lunch and dinner included with Tea and Coffee. 09 Trek to Gokyo: (4790m). Beyond Machhermo the trail climbs a ridge for an excellent view both down the valley to Kantega and up towards Cho-Oyu (8153m). Beyond the ridge the valley widens as the trail passes through Pangram at 4390m. We descend to the river bank before beginning the climb up to the terminal moraine of the Ngozumpa glacier. It is a steep climb on the moraine. Afterwards, the trail levels out as it follows the valley past a second lake, known as Longponga at 4690m, then finally up a boulder-strewn path to Gokyo at 4,750m Overnight stay at guesthouse with breakfast, lunch and dinner included with Tea and Coffee. Leaving the camp at dawn, we will easily and slowly climb the path going up to Gokyo Peak , higher than Mont-Blanc. From the top, fantastic view on the immense Ngozumba glacier, and on 123 different peaks, including Mount Everest, Lhotse, Cho Oyu and Makalu . We go back to the camp in the evening for rest. Overnight stay at guesthouse with breakfast, lunch and dinner included with Tea and Coffee. After a short descent to Longpongo lake, all our caravan go through the glacier of Ngozumpa, on the moraines which hide the ice. We will discover very nice small glaciar lakes. We take Lunch on the other bank of the glacier Overnight stay at guesthouse with breakfast, lunch and dinner included with Tea and Coffee. A wild stage, beginning by one hour and a half on the steep snowy footpath leading to Cho La pass. From the pass, superb view on Dzonglha valley and lake and on the impressive North faces of Jobo Lhaptshan, 21,128 feet. We Descent to Dzonglha, with a quite hard walk on the Cho La glacier. We take rest at camp in the evening Overnight stay at guesthouse with breakfast, lunch and dinner included with Tea and Coffee. Continue along the moraine of the glacier, with views of Kalapathar and Pumori, before reaching Lobuche at (4910m) for your evening stay. This is the last stop before the climb to the base camp the next day. It is important to take the time to rest and acclimatize for this unforgettable day. Overnight stay at guesthouse with breakfast, lunch and dinner included with Tea and Coffee. To reach our next stop, Kala Pattar, we follow the Khumbu Glacier. The trail offers superb views of the surrounding mountains, especially where the path is forced to rise to cross a tributary glacier. We stop for lunch at our camping place or lodge at Gorak Shep. Overnight stay at guesthouse with breakfast, lunch and dinner included with Tea and Coffee. Everest Base Camp is the main camp for mountaineers attempting the mountain, situated at an elevation of 5252m. Trekkers feel understandably great satisfaction in reaching here as the Everest Base Camp is not only full of history but breathtakingly dramatic, perched at the foot of the infamous Khumbu icefall. Overnight stay at guesthouse with breakfast, lunch and dinner included with Tea and Coffee. We trek down hill mostly this day. As we retrace our steps to Duglha and descend to Pheriche, we arrive at The Himalayan Rescue Association, a trekker’s aid post and it is a worthy place to visit. After lunch, we cross the Khumbu Khola on a wooden suspension bridge and follow the Imja Khola to the village of Pangboche . Overnight stay at guesthouse with breakfast, lunch and dinner included with Tea and Coffee. Here is the oldest monastery in the region which contains what is said to be the scalp and bones of a Yeti, or abominable snowmanthe. Leaving mountains behind us, our descent takes us through Tengboche Monastery at elevation of 3860 meters before continuing back to the town of Namche Bazaar at 3441meters. We arrive back into Namche Bazaar in the afternoon Overnight stay at guesthouse with breakfast, lunch and dinner included with Tea and Coffee. Trek from Namche Bazaar to Phakding (2652m.) and it takes about four hours. The trails descend steeply for early one and half hours. After that, the path has small ups and down to Phakding through Monjo. Overnight stay at guesthouse with breakfast, lunch and dinner included with Tea and Coffee. Trek from Phakding to Lukla [2886m] and it takes about three hours. Your final day's trekking follows the Dudh Kosi back down to Lukla. The trail then continues back towards Lukla, where we will reconfirm our flight tickets for the next day and spend the night. This last evening in the mountains is the ideal opportunity for a farewell party with the sherpa guides and porters, where you can sample some Chhang (a kind of local alcohol), try Sherpa dancing and look back on a memorable trekking experience and staffs are expecting for precious Tips. Overnight stay at guesthouse with breakfast, lunch and dinner included with Tea and Coffee. After breakfast, our city guide reaches in Hotel with Vehicles, and then we drive to Bhaktapur Durbar Square . Bhaktapur is one of the oldest cities in Kathmandu valley. It is well known as Living Museum . Old brick paved enclave of old Royal palace, Nyathapola Temple , Datatriya temple, exquisite artwork offers a picture of the grandeur of medieval Nepal . And Patan is located 7 km away from Kathmandu ; this city has many 15th to 17th century, Hindu and Buddhist, monuments built during the Malla dynasty. The most important area with many monuments is the Patan Durbar Square . We stay overnight at hotel.